The National Trophy cyclo-cross series is set to be decided with a showdown at Rutland Water on Sunday afternoon. Jody Crawforth (Hargroves Cycles) leads defending champion Paul Oldham (Hope Factory) by a single point. Ahead of the sixth and final race, it’s simple: whoever finishes in front of the other will take series victory. The weekend after taking his first elite national ‘cross title in Derby, Oldham is angling to defend his Trophy title. “It’s good for me at Rutland, I’ve always done well there. But Jody isn’t going to want to get beaten twice in a week, I’m sure he’ll be very keen to put me away,” he said, referring to Crawforth’s narrow defeat last Sunday. A popular national champion, Oldham has been surprised by the wealth of well-wishing after his victory. Twelve months ago, the series finale saw a Belgian clean sweep, as Rob Peeters (Fidea) beat compatriots Kenneth van Compernolle and Ben Berden. However, van Compernolle is expected to be the only Belgian in attendance this time round, as the likes of 2010-11 Trophy regulars Kris Lapere and Floris de Tier stay in Belgium with illness. Meanwhile, others are opting to race at the weekend World Cup race in France. There’s a home challenger too, with nationals bronze medallist Liam Killeen (Giant) down on the start list. 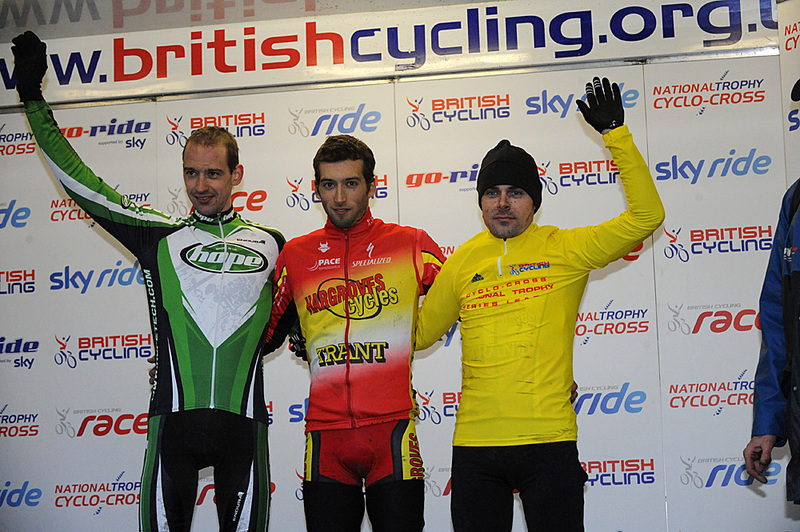 The winner’s podium at the last round in Bradford. But who will take the final win: Oldham (left) or Crawforth (right)? Peter Kennaugh and Luke Rowe have teamed up to make a formidable combination for the National Madison Championship in Manchester tomorrow. Although the pair have never won the National Championship together before, one of them has been on the winning team for the past four years. Rowe teamed up with Mark Christian to win last year’s race and was also victor of the 2007 title with Adam Blythe. Kennaugh took the title in the intervening years with fellow Manxmen Mark Cavendish (2008) and Mark Christian (2009). A strong list of riders make up the 13 other teams that will challenge the favourites for the title. Amongst them are new Rapha signings Ed Clancy and Andy Tennant and their team mates Dean Downing and Graham Briggs. Racing starts at 1.30pm and precedes the evening’s Revolution meeting. There, the main billing sees a very busy Ed Clancy go head to head with Australia’s Leigh Howard, the previous occupier of his world omnium champion’s jersey. The Horizon Fitness women’s racing team has added a new face to its lineup. Mexican rider Nancy Arreola will be joining the team from March onwards. The diminutive Mexican is her country’s 2010 national scratch points champion and the winner of the 2009 national point race. The Mexican rider has up until now raced in her native country, and the team are expecting her to take a bit of time to adjust to the more hectic schedule involved in European racing. She plans to race in the UK and in some of the team’s races in Europe. The Vanillabikes.com cycling team has signed Harry Grey and Duncan Orme, increasing their roster to four. Their new additions are intended to increase the team’s participation at both local and national level, alongside current riders Adam Norris and Jack Pullar. 22-year-old Grey went from novice to second-category last year. For 2011, he aims to move up another level and tackle a number of Premier Calendar and other National Elite level races. Meanwhile, sports science lecturer Duncan Orme is the new elder statesmen of the squad and the team’s time trial specialist.